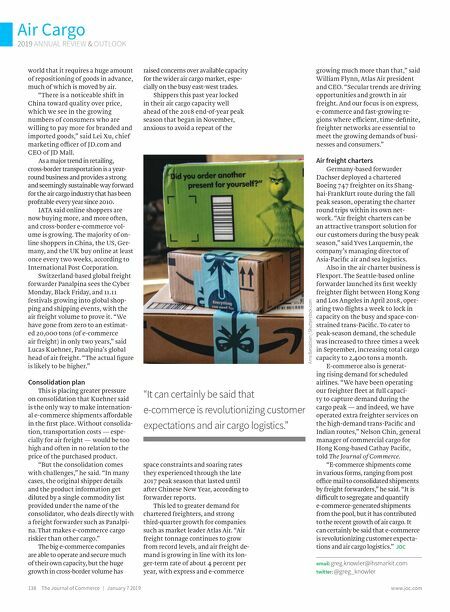 EXECUTIVE COMMENTARY | Air Cargo 2019 ANNUAL REVIEW & OUTLOOK Januar y 7 2019 | The Journal of Commerce 139 www.joc.com But our airports are already con- gested; traditional freight gateways and large passenger-focused airports are reporting congestion and delays in recovering cargo shipments. How will the industry support this growth, and where will the new alternative gateways grow that will support the global volume while also managing to stay local for the last-mile delivery? Some solutions have been created: Mesa Gateway in Greater Phoenix, and Columbus Rickenbacker Airport are such examples. In Mesa, a group known as Sky - bridge USA has created with the help of Mexican and US Customs a very unique process called the UCP (Uni- fied Customs Processing) that allows freight to move from global sources to Mesa (with three parallel 10,500- foot runways), and get completely cleared by SAT-Mexican authorities for "domestic flight shipments" into Mex- ico. Using UCP, goods can be delivered via air cargo in 50 percent of the time it takes today. At Rickenbacker, the airport authority along with its consulting teams have increased air cargo lift capacity from two 747 freighters per week to 19 freighters per week. New cities and their airports, new logistics models, new clearance and processing protocols are necessary. 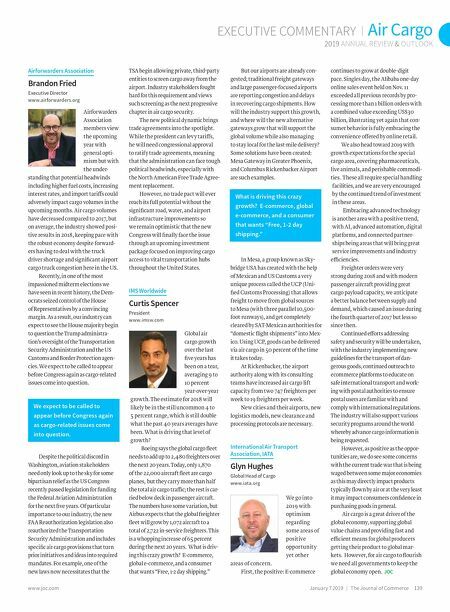 International Air Transport Association, IATA Glyn Hughes Global Head of Cargo www.iata.org We go into 2019 with optimism regarding some areas of positive opportunity yet other areas of concern. First, the positive: E-commerce Airforwarders Association Brandon Fried Executive Director www.airforwarders.org Airforwarders Association members view the upcoming year with general opti - mism but with the under- standing that potential headwinds including higher fuel costs, increasing interest rates, and import tariffs could adversely impact cargo volumes in the upcoming months. Air cargo volumes have decreased compared to 2017, but on average, the industry showed posi - tive results in 2018, keeping pace with the robust economy despite forward- ers having to deal with the truck driver shortage and significant airport cargo truck congestion here in the US. Recently, in one of the most impassioned midterm elections we have seen in recent history, the Dem- ocrats seized control of the House of Representatives by a convincing margin. As a result, our industry can expect to see the House majority begin to question the Trump administra- tion's oversight of the Transportation Security Administration and the US Customs and Border Protection agen- cies. We expect to be called to appear before Congress again as cargo-related issues come into question. Despite the political discord in Washington, aviation stakeholders need only look up to the sky for some bipartisan relief as the US Congress recently passed legislation for funding the Federal Aviation Administration for the next five years. Of particular importance to our industry, the new FAA Reauthorization legislation also reauthorized the Transportation Security Administration and includes specific air cargo provisions that turn prior initiatives and ideas into required mandates. For example, one of the new laws now necessitates that the TSA begin allowing private, third-party entities to screen cargo away from the airport. Industry stakeholders fought hard for this requirement and views such screening as the next progressive chapter in air cargo security. The new political dynamic brings trade agreements into the spotlight. While the president can levy tariffs, he will need congressional approval to ratify trade agreements, meaning that the administration can face tough political headwinds, especially with the North American Free Trade Agree - ment replacement. However, no trade pact will ever reach its full potential without the significant road, water, and airport infrastructure improvements so we remain optimistic that the new Congress will finally face the issue through an upcoming investment package focused on improving cargo access to vital transportation hubs throughout the United States. IMS Worldwide Curtis Spencer President www.imsw.com Global air cargo growth over the last five years has been on a tear, averaging 9 to 10 percent year-over-year growth. The estimate for 2018 will likely be in the still uncommon 4 to 5 percent range, which is still double what the past 40 years averages have been. What is driving that level of growth? Boeing says the global cargo fleet needs to add up to 2,480 freighters over the next 20 years. Today, only 1,870 of the 22,000 aircraft fleet are cargo planes, but they carry more than half the total air cargo traffic; the rest is car - ried below deck in passenger aircraft. The numbers have some variation, but Airbus expects that the global freighter fleet will grow by 1,072 aircraft to a total of 2,722 in-service freighters. This is a whopping increase of 65 percent during the next 20 years. What is driv - ing this crazy growth? E-commerce, global e-commerce, and a consumer that wants "Free, 1-2 day shipping." continues to grow at double-digit pace. Singles day, the Alibaba one-day online sales event held on Nov. 11 exceeded all previous records by pro - cessing more than 1 billion orders with a combined value exceeding US$30 billion, illustrating yet again that con - sumer behavior is fully embracing the convenience offered by online retail. We also head toward 2019 with growth expectations for the special cargo area, covering pharmaceuticals, live animals, and perishable commodi - ties. These all require special handling facilities, and we are very encouraged by the continued trend of investment in these areas. Embracing advanced technology is another area with a positive trend, with AI, advanced automation, digital platforms, and connected partner - ships being areas that will bring great service improvements and industry efficiencies. Freighter orders were very strong during 2018 and with modern passenger aircraft providing great cargo payload capacity, we anticipate a better balance between supply and demand, which caused an issue during the fourth quarter of 2017 but less so since then. Continued efforts addressing safety and security will be undertaken, with the industry implementing new guidelines for the transport of dan - gerous goods, continued outreach to ecommerce platforms to educate on safe international transport and work- ing with postal authorities to ensure postal users are familiar with and comply with international regulations. The industry will also support various security programs around the world whereby advance cargo information is being requested. However, as positive as the oppor - tunities are, we do see some concerns with the current trade war that is being waged between some major economies as this may directly impact products typically flown by air or at the very least it may impact consumers confidence in purchasing goods in general. Air cargo is a great driver of the global economy, supporting global value chains and providing fast and efficient means for global producers getting their product to global mar - kets. However, for air cargo to flourish we need all governments to keep the global economy open. JOC We expect to be called to appear before Congress again as cargo-related issues come into question. What is driving this crazy growth? E-commerce, global e-commerce, and a consumer that wants "Free, 1-2 day shipping."